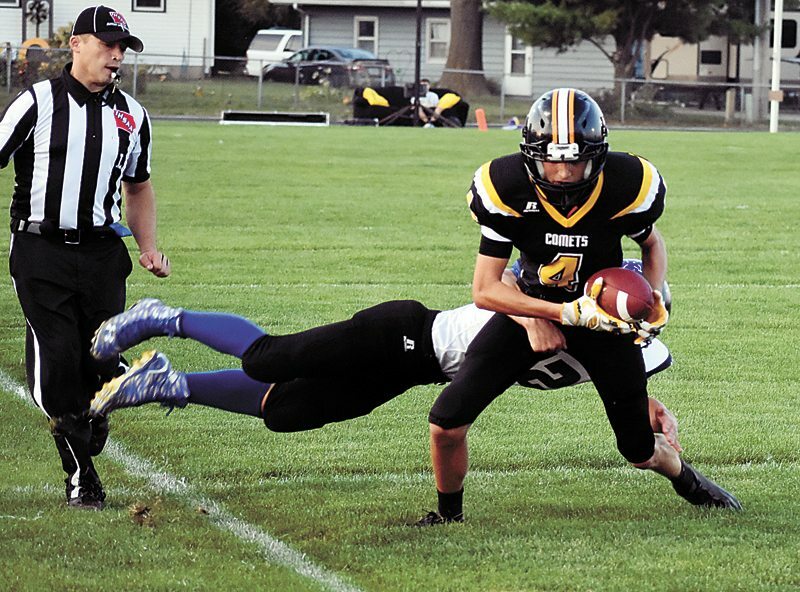 T-R PHOTO BY THORN COMPTON • BCLUW quarterback Brad Barkema is brought down by Central Spring’s Azik Hodak during the first quarter of the Comets’ loss to the Panthers on Homecoming, 36-28. Barkema led BCLUW in rushing with 49 yards and through for three touchdowns in the loss. 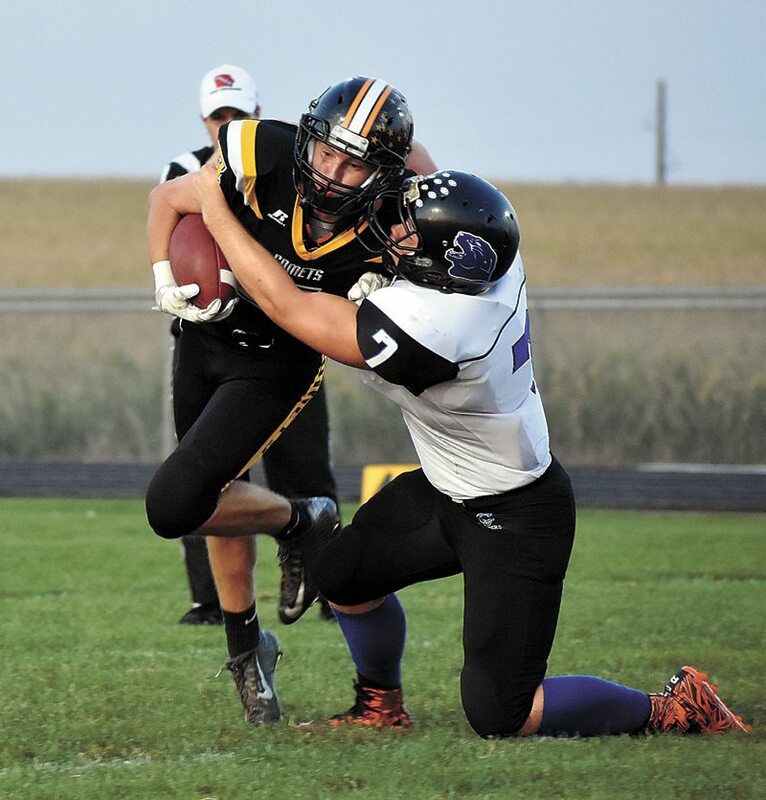 CONRAD — Things couldn’t have started much better for the BCLUW football team on Friday night in its homecoming match against Central Springs. On the opening drive to start the first quarter, the Comets marched down the field and capped things off with a 30-yard touchdown strike from quarterback Brad Barkema to senior Troy Dolphin. 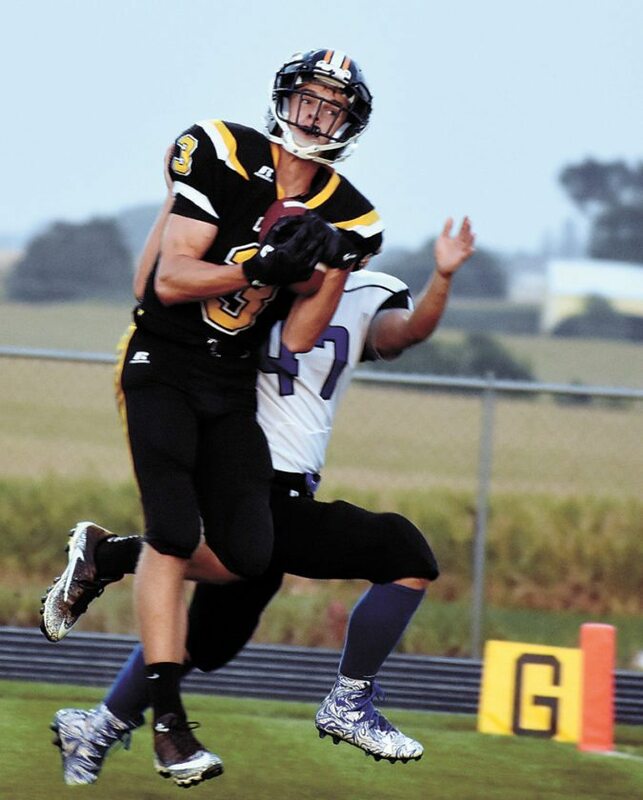 Then after forcing a three-and-out of the Panthers on their first drive, Barkema found junior Jack Garber for a 71-yard connection that put BCLUW up 14-0 midway through the first quarter. Once things settled down, however, Central Springs started to churn away with its run game and the Panthers eventually overcame the Comets 36-28. BCLUW head coach Anthony Jahr said, given the general size difference his players faced against a huge Central Springs (3-1) squad, he was genuinely happy with how they performed on the night. The most physically-imposing player on either team on Friday night was the Panther’s 240-pound running back Zack Santee, who amassed 231 yards on the ground and three touchdowns off 35 carries. Jahr said facing a guy who just pounds the rock like Santee does, he’s going to gain some yardage, but aside from a 51-yard touchdown scamper by the deceptively-quick back in the third quarter, he thought the Comets (1-3) contained him relatively well throughout the evening. As Jahr alluded to, the game came down to both what the Panthers were able to do on big plays and what the Comets weren’t able to finish. Central Springs didn’t throw the ball much, but it did connect on a 50-yard and 25-yard pass that both set up touchdown drives in the first half, and a 71-yard run by Zach Ryg after Santee’s long touchdown run was the eventual game winner for the Panthers. 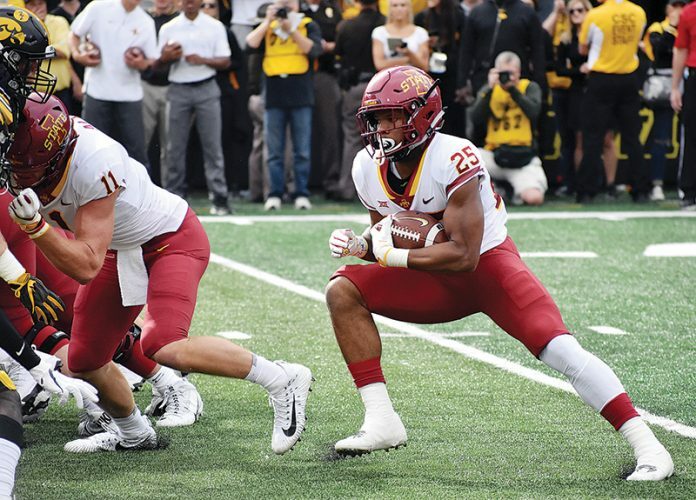 On the other side of that argument, Barkema finished the night 10-for-24 for 174 yards and three touchdowns, but if not for some ill-timed drops by his receivers and miscommunications his line would have been significantly more impressive. Jahr said missing on those big plays on the offense can kill a team’s momentum, and he feels that’s what happened to his Comets on Friday. Losing a close game at home is always a tough pill to swallow, and that goes double when it’s a homecoming game. Jahr said this loss will sting for quite some time, but hopefully his guys learn from the pain and come out ready to reverse their fortunes next time out. “It hurts, we took one on the chin, but if nothing else we will learn what not to do down the stretch and hopefully we will learn from that,” he said. BCLUW — Troy Dolphin 30 pass from Brad Barkema (Connor Thompson kick good), 8:42. BCLUW — Jack Garber 71 pass from Barkema (Thompson kick), 5:03. CS — Zack Santee 9 run (Santee run), 2:12. CS — Santee 12 run (run failed), 10:44. BCLUW — Dolphin 16 pass from Barkema (Thompson kick), 9:47. CS — Azik Hodak 1 run (Santee run), 4:52. CS — Santee 51 run (Zach Ryg run), 7:20. CS — Ryg 71 run (run failed), 6:20. BCLUW — Greg Schmitt 2 run (Thompson kick), 1:48. 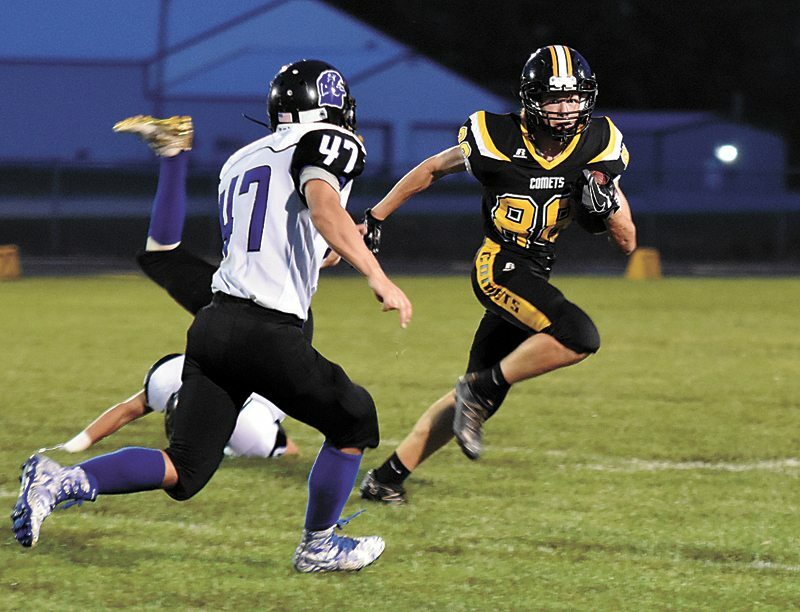 RUSHING — CS: Santee 35-231, Ryg 10-158, Hodak 10-37, Dylan Kisner 2-0, Sebastian Beck 1-0; BCLUW: Barkema 11-49, Scmitt 7-16, Blake Mann 4-14, Colby Willett 3-4, Thompson 3-1. 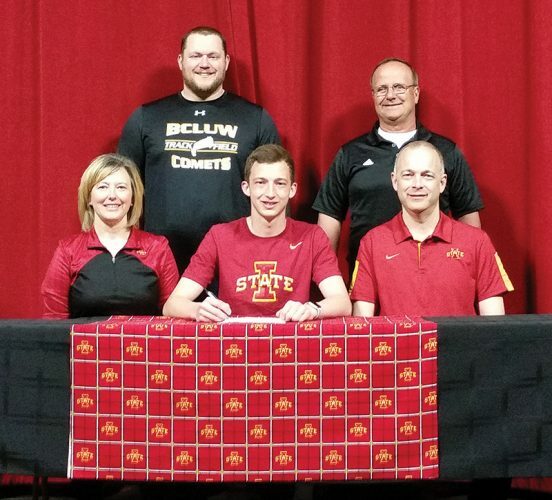 PASSING — CS: Kisner 3-5-77-0; BCLUW: Barkema 10-24-174-0. RECEIVING — CS: Beck 2-52, Allen Alexander 1-25; BCLUW: Garber 6-110, Dolphin 2-46, Mann 1-7, Thompson 1-6.